Twisted pair cable. Traditionally, 1-pair or 2-pair telephone type cable (typically to BT spec. CW1308) was used to connect each user intercom station to the central exchange equipment. 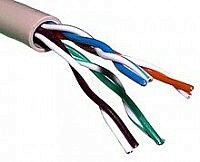 However, with the advent of wired computer networks came an abundance of Cat5/6 cable which features 4 twisted pairs and which may also be used to provide connectivity for one or more analogue intercom user stations. The wired intercom provides very reliable service with very little down time due to network communications issues. Be aware that line length can become an issue where the analogue system relies upon low level electrical (DC) signals to convey various conditions to the central equipment e.g. handset on/off hook, press-to-talk etc.,. In a typical analogue system, the maximum line length (central equipment to farthest intercom user station) may be expressed as a loop resistance figure e.g. 240 Ohms (120 Ohms per wire) – this equates to a line length of approx. 1.4km using 0.5mm diam. copper conductors.